T-Mobile USA reported its second quarter 2012 earnings on Thursday, in which the carrier noted that its service revenues totaled $4.4 billion for the quarter, down 5.2% from the $4.6 billion recorded during the same period last year. Those revenues, however, remained on a par with the $4.4 billion reported during the first quarter of this year. The carrier also noted net customer losses of 205,000 during the second quarter, compared to 50,000 net customer losses during the second quarter of 2011. Those losses are likely due to consumers switching to AT&T, Verizon or Sprint, all of which have rolled out faster 4G LTE networks ahead of T-Mobile. The carrier also noted branded net customer losses of 557,000 during the quarter, compared to 510,000 branded net customer losses during the first quarter of this year and 53,6000 branded contract net customer losses during the same time period last year. The carrier's churn improved and now sits at 2.10%. T-Mobile said it plans to expand its network coverage and roll out 4G LTE service next year, which should help it better compete against the three largest carriers in the United States. Its AWS spectrum transfer agreement with Verizon Wireless will be a key component of its ability to do just that. It will also focus in investing in promoting its brand. BELLEVUE, Wash., August 9, 2012 — T-Mobile USA, Inc. today reported second quarter 2012 results. In the second quarter of 2012, T-Mobile USA reported adjusted OIBDA of $1.34 billion, up 4.8% from $1.28 billion reported in the second quarter of 2011. Net customer losses were 205,000 in the second quarter of 2012, compared to 50,000 net customer losses in the second quarter of 2011. "In the second quarter, T-Mobile USA continued to show considerable progress in a number of key areas delivering solid adjusted OIBDA growth. While we reported encouraging branded contract and branded prepaid churn improvements in the quarter, we remain focused on customer loyalty as we continue to execute against our strategy" said Jim Alling, Interim CEO and President of T-Mobile USA. "Looking ahead, T-Mobile USA will continue to invest in a number of key areas including the modernization of our network as we pave the way for LTE service in 2013, retail expansion, as well as an increased investment in promoting our brand." "In the second quarter T-Mobile USA started the implementation of key initiatives, such as network modernization, which will improve its competitiveness going forward," said René Obermann, CEO of Deutsche Telekom. "We are also encouraged by the strong cost discipline demonstrated by T-Mobile USA." T-Mobile USA continues to execute on its key strategic initiatives, which include its $4 billion 4G network evolution plan to expand its voice and data coverage around the country and to initiate long term evolution ("LTE") service in 2013. In the second quarter of 2012, T-Mobile USA announced an agreement with Verizon Wireless for the purchase and exchange of certain Advanced Wireless Services (AWS) spectrum licenses (subject to regulatory approval), which would improve T-Mobile's network coverage in 15 of the top 25 markets in the U.S.; completed the AT&T deal break-up AWS license transfers that will expand T-Mobile's coverage in 12 of the top 20 U.S. markets; and announced a spectrum exchange agreement with Leap Wireless International, Inc. that will further 4G coverage in four states. In addition to these spectrum agreements, T-Mobile USA announced multi-year agreements with Ericsson and Nokia Siemens Networks to deploy state-of-the-art LTE-capable equipment at 37,000 cell sites in 2012 and 2013. T-Mobile USA increased its distribution channels in the second quarter of 2012 announcing the opening of its 1,000th T-Mobile Premium Retailer (TPR) store. In addition, a new distribution arrangement with Dollar General Corporation brings an affordable phone and convenient access to T-Mobile's prepaid and Monthly4G™ No Annual Contract service to more than 6,400 Dollar General stores. In total, T-Mobile USA added approximately 8,700 prepaid doors in the second quarter of 2012. To expand its reach in the business-to-business market, T-Mobile USA began offering two new suites of mobile broadband data plans to address the growing use of mobile broadband devices and the increasing demand for data among business customers. T-Mobile USA also launched its "Open Europe" plan for business customers – a new unlimited data feature with a flat-rate monthly fee. The Company also signed two additional agreements with Mobile Virtual Network Operator ("MVNO") partners in the quarter to drive further expansion into this customer segment. 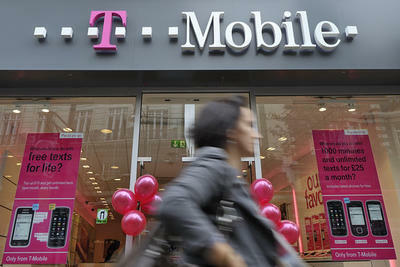 T-Mobile USA further expanded its portfolio of compelling 4G smartphones in the second quarter of 2012. T-Mobile USA became the first U.S. carrier to offer the 42 Mbps-capable HTC One™ S and also launched the highly anticipated Samsung Galaxy S™ III. In addition to these devices, T-Mobile USA also launched the T-Mobile® Prism™, a budget-friendly option for cost-conscious consumers and expanded T-Mobile's myTouch® family with the announcement of the next-generation T-Mobile® myTouch® and T-Mobile® myTouch® Q, launched in July 2012. In early August, T-Mobile USA launched the Samsung Galaxy Note™, featuring a 5.3-inch HD Super AMOLED™ screen. The Company is supporting its strategic investments with its brand re-launch program, continuing with a new advertising campaign that encourages customers to Test Drive T-Mobile USA's competitive 4G experience. During the second quarter of 2012, T-Mobile USA continued to focus on driving efficiencies across the business. Examples of this include the new organizational structure announced in May 2012 that will enable the Company to react with greater speed and effectiveness to customer and market opportunities, that aligns costs with revenue realities, and that better positions T-Mobile USA for growth. The Company also continues with its efforts to drive operational efficiencies with the Reinvent program and is well on track to achieve $900 million in gross savings, which will be partially reinvested into customer acquisition programs. Lastly, the multi-year churn reduction program showed encouraging progress in the second quarter of 2012.